Are you a comedy fan? Whether you like catching up-and-comer stand-up comedians at 2-drink-minimum comedy clubs or seeing superstars of the comedy world on their latest arena tours, buyTickets.com has all the best tickets at great prices. From stand-up to podcast tapings, sketch, improv, and more we’ve got it all. No joke! 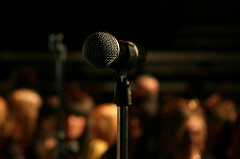 Browse the comedy show schedule below, find events near you or browse the list of comedians at the bottom of the page. Click the yellow Buy Tickets button, find your perfect seats, and voila! You’ll be laughing in no time! Even better: you can use the promo code SAVEBIG at checkout for even more savings!